Muriel Spark, aged 88, died on 14 April 2006 in hospital in Florence, Italy. Her funeral was held on 15th April in the church of Oliveto, a suburb of Civitella della Chiana, a delightful little place in Tuscany where she had been living for 26 years. In September 2005 Muriel Spark had received the honorary Citizenship and the keys of the Town. 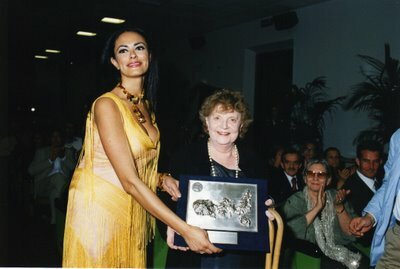 With her novel Invidia (Envy), published by Adelphi, she won the 2005 edition of the Literary Prize Isola d'Elba. In the photo we see her while receiving the prize from the Italian actress Maria Grazia Cucinotta. Dame Muriel's first novel was published in 1957 but it was the 1962 classic, The Prime of Miss Jean Brodie, that brought her to the publicâ€™s attention following good reviews from critics. The book was turned into a movie starring Dame Maggie Smith, bringing her a best actress Oscar in 1969. In the course of her career Dame Muriel wrote over 20 books, which included not only novels but also critical studies of Mary Shelley and Emily BrontÃ«. BrontÃ« Society Gazette is the news magazine of the BrontÃ« Society. It is sent to members three times a year, and is not to be confused with BrontÃ« Studies, which is an academic journal - see the link on the right. Below is a book review from the most recent issue, which follows on from an article in the January issue by the bookâ€™s author, Julie Noble (pictured above), entitled Was Maria dyspraxic? Please contact the blog (email address on the right) if you wish to make a comment. Talli's Secret or Cassie's story by Julie Noble is dedicated to 'all who know what it is to struggle' It is inspired by children who have lots to contribute and express but for whom the school system, with its structures and emphasis on the written word, thwarts and disables. Julie Noble's own son, like my own, has struggled this way. The inspiration for the book came when studying Jane Eyre and learning that Helen Burns was based on Charlotte's eldest sister Maria, and that Helen was arguably literature's first dyspraxic. Cassie's class are studying the Brontes. Like Helen Burns at Lowood, Cassie struggles at school and is berated by her teacher. She is misunderstood as defiant and mocking. Mrs Harrison uses 'hardened' and 'slatternly', the same words that Helen's teacher uses on her. The life-threatening physical conditions which Charlotte Bronte fictionalised in Jane Eyre are unimaginable to Cassie but we discover that the misery and frustration experienced by Cassie is uncannily similar to that of Helen. What stood out for me over and above the struggle of children with dyspraxia or dyslexia is the magic of creativity and the therapeutic value of story telling..
Charlotte BrontÃ« saw that children can feel but can't analyse their feelings. As a Psychotherapist I would say that children need relational experiences with those close to them to express and process their feelings and to develop a sense of themselves and their life story that matures and develops with them. Talli's Secret is a wonderful account of how trauma and loss can rupture the coherence and meaning of individual stories. Better still it goes on to describe a process of transformation and the bringing together of those involved, their individual and overlapping stories to replace brokenness and despair with hope. Cassie survived the road accident which killed her sister Lizzie and disabled her father. The family is stuck, barely living, futilely going through the motions of daily life. There is a heaviness and poignancy about her parents' mutual estrangement. Their communication is as tight as the matchstick house her father labours over. They have no space in themselves for Cassie and her difficulties. Cassie is in a daze, preoccupied but unable to bring into focus the impressions that fuel her silent vigil. A school trip to the Parsonage sets her off working it all out. But not on her own. She makes two new friends, a new girl at school and Talli (Charlotte BrontÃ«) who both become important in sharing and witnessing her experience. I found the encounters with Talli confusing but the message is clear. Cassie's experience is recognised by Talli. They share the loss of their sisters and Cassie learns that Maria, 'the most talented of us all' had struggled at school like her. Talli encourages Cassie to talk about her dead sister Lizzie. Cassie asks what Talli did with her grief. The secret is Scribblemania, the compulsion to write. Talli/Charlotte had put Maria into Jane Eyre. Writing works for Charlotte as a way of making something of the unbearable. Cassie discovers the delights of reading and steams through Jane Eyre. Later, when asked to explain the mess she's in with her teacher and the bullying school girl Savannah; Cassie remembers Miss Temple's imperative to Jane, to tell her story, to add and exaggerate nothing. She tells it and everything starts to shift. The teacher understands. Her homework that weekend is making books as the Brontes did. Cassie can't wait. She finds words 'whispering in her brain', and her fingers itching to write them. She writes her book 'Talli's Secret'. The parents are approached and awoken, unwillingly at first, out of their deadly retreat. Cassie frees herself and becomes a catalyst for change in those around her, her family, her teachers and her bully. The book holds several paradoxes for me. We have in Cassie the learning difficulties dyspraxia and dyslexia and the emotional befuddlement associated with trauma and loss which can make learning difficult. Did Cassie have these problems before? If so, she would be likely to need more than understanding and inspiration to take to the written word with fluency. The book, like Cassie, has rather too much going on. There is a lot to hold on to and digest as I read it and a lot I'm puzzled about. Having said that I could also say that this is a book with a lot going on of which there is much to mull over. The readers that engage with it will find it a meaty read, others might find it confusing and a bit much. 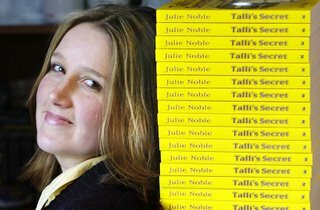 Talliâ€™s Secret, recently long-listed for the Whitbread Book Awards, is available from the Parsonage shop - please use the link on the top right.